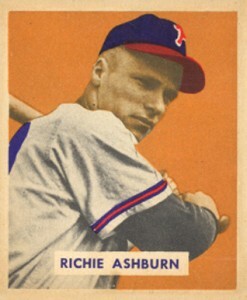 A fan favorite during baseball's Golden Age, Richie Ashburn cards are very popular with fans and collectors of the Philadelphia Phillies. He spent 12, of his 15 years playing for the team. During that time he made the All-Star team six times. He was also a two-time batting champion. Ashburn retired with a lifetime batting average of .308. Richie Ahburn's rookie card is from the 1949 Bowman Baseball set. He also has a couple of first-year regional issues: 1949 Philadelphia Bulletin and 1949 Lummis Peanut Butter. Ashburn died in 1997, just at the point that the hobby began to put an emphasis on memorabilia and autograph cards. As a result, all of his autograph cards are cut signatures. The first was issued with the 2002 SP Legendary Cuts set. It is limited to ten serial-numbered copies. His first memorabilia card was issued in 2001 SP Legendary Cuts. The card contains a piece of an Ashburn game-used bat. It is not serial numbered but is considered to be a short print. 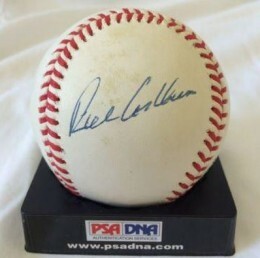 Richie Ashburn's autographed memorabilia is affordable but has room to grow in value. Prior to his death, he had been a frequent signer at sports collectibles shows. Baseballs, photos and cards are the most commonly found items. Signed jerseys and bats do exist and carry a significant premium. They are, however, fairly rare and great caution should be taken when looking to purchase a premium signed Richie Ashburn piece of memorabilia. Ashburn and his fellow Phillies teammate and Hall of Fame brethern, Robin Roberts, both have rookie cards in 1949 Bowman. With Ashburn's card, there is a significant premium in the value of professionally graded cards receiving high marks. This amount can often be four figures when comparing a card in Good versus Excellent condition. 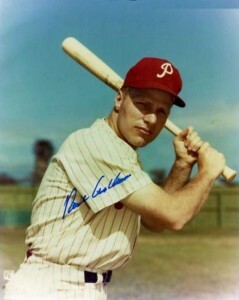 Below you will find an example of what Richie Ashburn's authentic signature looks like. This can be used as a first point of reference for determining the legitimacy of autograph memorabilia, but is not a substitute for having your items authenticated by a well-respected professional autograph authentication company. Some of the trusted sources within the sports memorabilia market include the following companies: PSA, JSA, Steiner, Mounted Memories and Tristar. Click on any of the images below to view full size photos. It can vary depending on the surface being signed. All of the letters are relatively uniform in size. The exception is the first letter of both names which are slightly larger than the others. The "R" resembles a "P" as the finishing line is located towards the bottom of the plane and used to connect to the "i," which is dotted. The "h" has a loop in the vertical line. The "A" doesn't form a complete loop. The remaining letters are discernible but not necessarily legible. 1950 BOWMAN RICHIE ASHBURN #84 PSA 9 OC MINT PHILADELPHIA PHILLES H.O.F.